cortex and wood. 5, White starchy wood. 6. Dark resinous wood. -Meningitis (especially with dullness and congestion), and for chronic Encephalitis (in greater than full doses, which are well tolerated in this condition). -relieves sweating and inflammation in Phthisis, Pneumonia, and other exhausting or wasting diseases. -Hahnemann proved the tincture given in very small doses could protect from the infection of Scarlet fever. -Cerebral congestion with delirium, red eyes, hot head but cold feet, and a purple colored face, lips, and tongue. -Choroiditis with burning and dryness of the eyes, and early stages of conjunctivitis. -Galen used it for Tumors and Cancer, and it was still used for this purpose until the 17th century; later being given internally and used externally. -this is mostly due to its effect of allaying any inhibitions, and promoting relaxation. i. much used in plasters, poultices, oils and liniments for strong Neuralgia, Gout, Rheumatic pain, Sciatica. ii. applied locally to Sprains and Strains. iii. a dilute liniment of Belladonna is a good application to the spine in Whooping Cough. iv. the ointment or plaster can be used for hot Swellings, old Ulcers, Cancers, hard Breast lumps etc. 2. Scopolia carniolica is a small European solanaceous plant that has a similar alkaloid content to Belladonna. It has been official in the USP. The leaves or rhizomes are used, the dose of the dried rhizome being 1–2 grains. 1. Sciatica; mix of equal parts of Tinctures of Colchicum, Belladonna and Aconite taken in doses of 6 drops every 6 hours. 2. Pain and Inflammation, make a vinegar with Belladonna leaf, Henbane leaf, Camphor, Peppermint, Rosemary, Lavender, Arnica, Clove, infused in Cider Vinegar. Used topically. Menthol can be added. i. and Scarlatina, take with Elder flower. ii. Belladonna extract, Henbane extract (3 grains each), Oxymel of Squill (half dram), Syrup of Marshmallow (2 drams). Dose: 1 teaspoonful. ii. Decoct the fresh herb several times; mix the decoctions together and evaporate in a water bath. i. Belladonna leaf (2 grains), Rob of Elder (sufficient). Make 8 boluses. One is taken every 2 hours for Whooping Cough and Scarlatina. i. Extract of Belladonna (1 scruple), Water (3 oz.). Mix. Applied to the eye for Cataract, to dilate the pupil. 2. Not used in people with Prostatic Hypertrophy, Paralytic Ileus, Glaucoma, Tachycardia, or by people using anti-depressants. 3. Not used for Paraplegia without irritation, or Reflex Paraplegia. 4. Signs of overdose include dryness in the mouth, tachycardic symptoms, mydriasis. Large doses of Atropine cause central excitation, restlessness, irritability, delirium and hallucinations. Gerard said it ‘bringeth madness if a few of the berries be inwardly taken’. Intoxication with Belladonna manifests with the following peculiar symptoms: complete loss of voice, together with frequent bending forward of the trunk, and continual movements of the hands and fingers. 5. Not stable in alkaline liquids. 1. Tricyclic antidepressants and Quinidine will increase the anticholinergic effect. 1. Belladonna is highly toxic in overdose. Asphyxiation can occur with 100mg of atropine, which corresponds to 5-50 grams of Belladonna. 2. 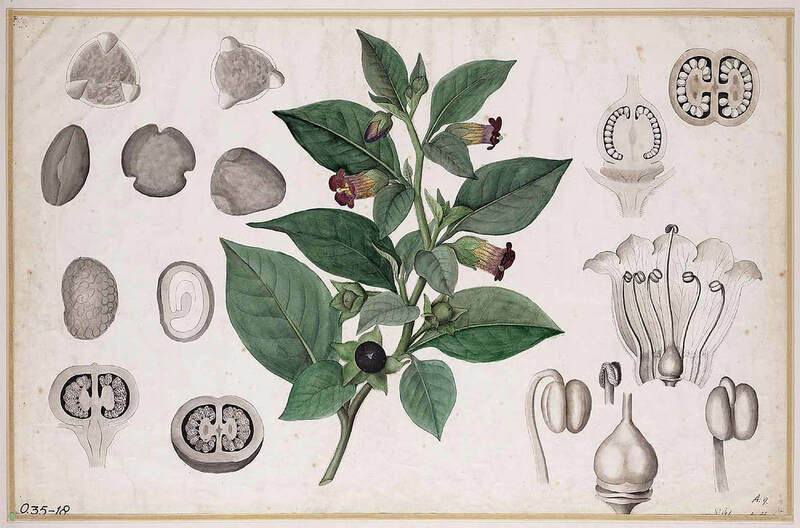 Over a 28 year period, the incidence of severe poisonings in Switzerland related to the use of Atropa belladonna was 42 cases; all had anticholinergic syndrome, 33 had acute psychosis, and 2 each had convulsions and coma. 1. Mead was listed by Salmon as an antidote. 2. Vomiting should be excited, followed by 1 teaspoonful of Charcoal; after this, milk and strong tea may be given. If the pulse is very weak, hold Smelling Salts (Ammonia) under the nose, and give a teaspoonful of Whisky every 20 or 30 minutes until 6 or 8 doses have been taken. 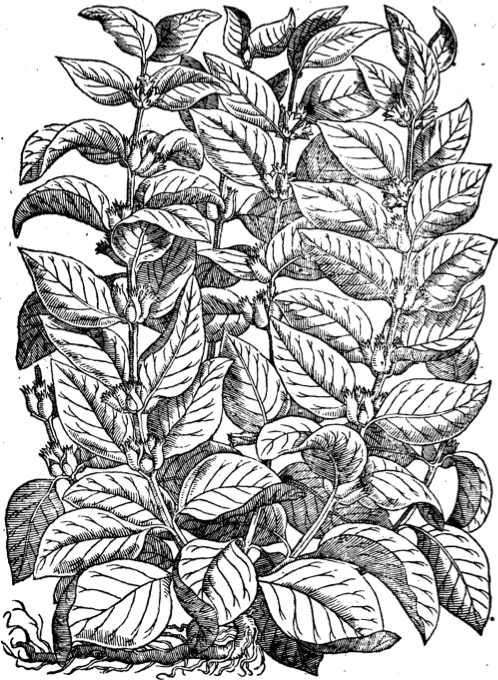 of poisoning by the latter plant he directs emetics to be given, and milk or honey and water, with aniseed and bitter almonds, to be administered.